After attending a three-year teacher college, John Kavishe taught for more than ten years with no encouragement or direction from the school administration or any form of professional development. He went straight from being behind the desk to standing in front of it with no resources to turn to for support. He felt lost because his students were not succeeding as he had always hoped they would. “Most of my colleagues were encouraging me to quit,” he remembered. When the Form 1 students at Ngateu Secondary School were given an English language assessment, not one of them scored above 60 percent. Still, the students are lucky, because they have Mr. Japhet Piniel on their side. “English is a struggle for my students, but I can’t accept failure. I just have to keep trying,” he said. “I am not discouraged by my students’ lack of English skills as much as I am challenged by it,” Marieth said of the 86 percent of students who failed the English language assessment at her school. Marieth has over thirty years of teaching under her belt, but that isn’t what makes her special. 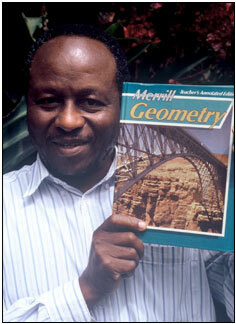 Stephen Mattowo is a devout Lutheran who has devoted years to teaching mathematics in the Lutheran schools system. He attributes his strong to his family’s connection to some of the early German Lutheran missionaries. The story begins in the 1800’s with Stephen’s grandfather.